Well some movement, but still no deal. Emirates takes delivery of sitting A380 frame, but no clarity on the pending additional orders. Yes, a very interesting, high stakes, three-way squeeze play: Airbus / EK / RR. I think Boeing is gleeful sitting this one out, but I hope Boeing is designing a twin-engine whale. Slot control will become more widespread: the era of the twin whale, with folding wings outboard of the pylons, not just folding wingtips. I am wondering if EK would prefer to not book any orders at this time, so they are doing the 'game' to see if a great deal can be done. Their last quarterly showed that their margin recently has been low with little revenue growth. As you talk about Boeing gleefully sitting on the sideline, what do you think is holding the 787 deal with Emirates up? Presumably one of the major players objected to content in the A.net thread, leaned on Bloomberg, who retracted the article, so A.Net removed. Or perhaps concern over possible insider information, relating to future GE and RR ownership. One thing to close a thread with explanation. Another to wipe all trace. Or moderation reckoned it didn't require a new thread...? Anyway, as said, if Emirates are putting pressure on Airbus to commit to an A380NEO now I reckon they won't succeed. Not before there is a decision from Boeing on the NMA and before the fallout of BREXIT becomes clear and strategical adjustments are decided. But perhaps EK just wants to improve their side of a deal that is not that sweet (but somewhat necessary) in the first place for two of the three involved parties. .. look in the "THE LONDON GAZETTE TUESDAY 31 DECEMBER 2013 SUPPLEMENT No. 1"
Thank you. ( first go I only found the mil awards ( my link ) and no Tim Clark. Timothy Charles Clark, President, Emirates Airline,Dubai, UAE. For services to British prosperity and to the Aviation Industry. As the other thread, the one about the last Bloomberg article has vanished, one has to post some comments again. To the T900. IMO the point about Emirates being unsatisfied with the newest piped version of the T900, is not fuel burn per se, but durability as in fuel burn retention over time and a to short time on wing between repairs. I assume RR compensates through their full service per hour package, but to frequent engine changes could be an irritant to Emirates. Regarding a new engine option for the A380. The Trent XWB is to powerful and heavy. and both the Trent XWB and 7000 are not advanced enough compared to the T900 to pay for an exchange. If we assume the T7000 to be 10% better than the T700EP2, the T900 is somewhere in the middle in between. Perhaps 5% above the T700 and 5% below the T7000. I assume, that it needs one engine generation more, to produce enough fuel burn advantage over the T900. It is sometimes forgotten, that the T900 presents a step up from the T700. First counter rotating core for the Trent and a signifikant higher bypass ratio, than all engines before. The engine I would look at, is the Trent Advanced. It would have a redesigned core, that is at it is tested in a XWB core, and I assume the new composite lighter fan, that is tested in front of an T1000. That engine could be ready around 2023-24, with no application in sight, but reegining, perhaps the A380 or even the A350. The Ultra fan is further out. In regards of the new 20 frames order securing production to the year 2029, that I think is a misunderstanding. With the 20 frames plus 16 options order comes increased delivery numbers from 2020. So I believe we will not see A380 production dip below 9 frames a year and the production is only secured to 2024, 20 frames, and 2025 with the additional 16 options. 1 What other application is gonna use the advance to share development cost with? 2 A large part of the initial inefficiencies of the A380 are caused by being a) a shrink and b) being heavy for it's wingspan. To address both (a stretch at the lowest possible MTOW) they need the most efficient engine they can get (as in the ultrafan). They are accepting a bit more loss with the lower production rate the comming years in order the make a lot more profit the many years after it enters service. Advance would probably be too tight of a development schedule when waiting for BREXIT and a NMA decision anyway. If a relocation of wing development/production will result from BREXIT than that will have it's influence on a possible re-wing decision as well. I mean If you gonna have to spend the cost of moving the whole wing production anyway or suffer the cost of having it outside the EU, why not use the opportunity to replace an 20 year old design for something state of the art (more laminar flow) and purpose built for a new lower MTOW and engine? Last edited by Taxi645 on Sun Dec 02, 2018 12:42 pm, edited 7 times in total. That is a good and fair summary of the present,past and indeed future situation Mjoelinr.And yes 2025ish does seem more reasonable from a production standpoint.Probably,if anyone could be bothered to do it,one could work out the Emirates delivery schedule quite accurately if one knew which of their A380's were leased and when ( I think they bought some outright,but not sure).They always seem to lease their aircraft over a 12 year period. As for what engines might be available.As stated ,the time for the T7000 has gone and it may be because it did not offer enough of a step forward,I guess we will never know. I don't see any engine being specifically built for a couple of hundred max A380's - by anybody.So it would have to form part of a wider replacement for the 787/350 families.This would have to be the Ultra-which is ( as I understand it) effectively a geared 'Advance' engine.I did notice recently that they had dropped the highly complicated and time consuming 'variable pitch' aspect of the composite fan and are steaming ahead with gearbox testing ( to 70 klbs I note).2025/6 may not be quite right but neither can it be far off at the present rate of progress imho. So its intended primary purpose is to serve as a VLA passenger airplane and its fallback mission is freighter. The numbers show that to be true. It's nice to have the freighter as a fallback, it is what is keeping the production line alive today. No, it was Boeings entry against the C5 galaxy for the military freighter contract. When they lost the turned it into a passenger & commercial freighter. Except that that is a myth - as I believe was already pointed out on this thread with references from Joe Sutter himself. Despite being debunked again and again through the years, the continued propagation of this "Alternative Fact" beggars belief. Nice theory, but the Bloomberg article still exists ( https://www.bloomberg.com/news/articles ... for-airbus ), the link to it still exists in this thread, and a pointer to the deleted thread still exists in this thread, so all evidence has not been wiped out. It is pretty dissatisfying to make the effort to start a thread and to have it deleted with no information as to why. The A380 is not that inefficient. It is according to Emirates more economical per seat, than the 777-300ER. The 777-9 with 1 2/2 to generations newer engines is supposed to be more efficient. Hang the T Advanced under the wings and the bird is again the most efficient. The claim against the A380 is sheer size. The advanced is in development, RR will need some frame to hang it on. How much of the Advanced is an actual new engine to hang on something, and how much of it is a research test bed for future changes/PIPs into the T1000/7000/XWB? The A380 is not that inefficient. It is according to Emirates more economical per seat, than the 777-300ER. I'm not saying it is inefficient, I'm say it has certain inefficiencies (1 high induced drag, 2 short length/low capacity vs built in capability, 3 old engine tech) that negatively compensate it's efficient double decker packaging. The better the SFC, the better all three can be addressed. The 777-9 with 1 2/2 to generations newer engines is supposed to be more efficient. Hang the T Advanced under the wings and the bird is again the most efficient. The claim against the A380 is sheer size. It doesn't just need to be the most efficient, it has to be more efficient by quite a large margin to compensate for it's size and the considerable required investment. I wouldn't be surprised if the advanced remains at the development stage, being just a development stepping stone for the ultrafan. That doesn't make much sense to me. This thread is about STC telling us RR will be the engine choice, i.e. EA was no longer in the running. And this thread was a follow-on of a previous thread about the RR vs EA engine order issues. The other thread was about what Airbus called "commercial challenges in dispatching completed A380s". At least that was what the intent was, when I created it. It largely veered into people posting their pet theories about A380neo. The only thing remotely controversial was the rumor that Airbus compensated the frames to EK, but that was just a rumor. Of course if this thread soon disappears we know that such a rumor caused a lot of angst somewhere. To me the big thing is that Airbus and all its partners just went through the NEO exercise two years ago and the answer was no, and if anything conditions for the program have gotten worse rather than better. The lack of interest in SQ's used frames and the news that AF will dump five frames earlier than anyone suggested really hurts the financial environment that A380neo would have to sell into. If they had transitioned to a T7000 based NEO two years ago they could have EIS'd in the same time frame as 777x so it would have been a relatively cheap upgrade and kept the pressure up on the competition, but now all we have is clouds over the A380 program. It is probably true that there is now a prevailing market price very near zero for good condition, used A388. 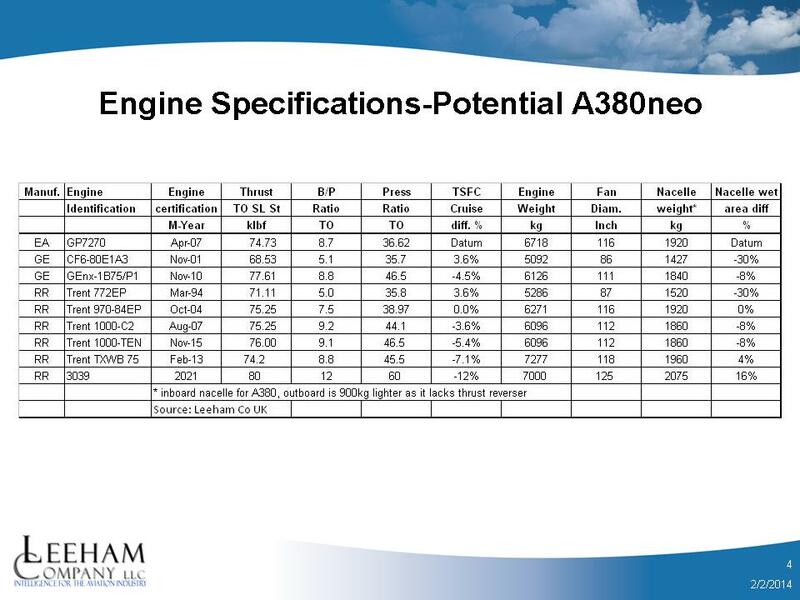 The market price of A388 NEO would be a function of its fuel burn improvement, plus the residual value of an A388 (zero). Is that enough to fund engineering and production.... looking unlikely. Last edited by Flighty on Sun Dec 02, 2018 2:24 pm, edited 2 times in total. +1 for Mjoelinr's summary. Interesting theory on Airbus maintaining 9/year production rate even after announcing 6/year. The data from the famous A380 production list can be found via Google cache here. From that one could work out the past trend line and project the future trend line to see if 6/year replacement rate is adequate or not. Maybe I'll do that later if I'm bored. Interesting update re: no more pitched fan, do you have a source you can share? Also merely being competitive cost/seat isn’t good enough. As Mjoelnr noted the A380 is still very competitive cost/seat, especially to its contemporaries, but that has not resulted in a slam dunk sales history. Airbus is not going to want to spend a few billion reengining the A380 just to keep better seat/costs so they can continue building the aircraft at a snail’s pace totally reliant on one customer. They need to make all aspects of the aircraft more attractive, which will probably require a more extensive refresh than than just a simple re-engine. The whole purpose of the EK order is to push the program far out enough where Airbus has the time, resources, and hopefully tech to focus on the A380. Right now priorities lay elsewhere (further development of A350, potentially A330neo, programs, dealing with potential 797, optimizing A220 production then focus on future development, etc). Airbus doesn’t have unlimited money and attention to go around. The point to reengine the A380 is, that it will not cost a few billion. The engine development is not paid by Airbus. A new pylon, the perhaps necessary new cabling and certification of the change will not cost that much. There is no need for a costly wing change to carry a perhaps slightly heavier engine. I hardly believe a Trent advanced would be much heavier than the GP7200. I would rather expect a lighter engine. Interestingly enough ( or not ), when we were first talking about A330neo here on a.net, many respected posters made the point that ( what became ) T7000 would not be a big enough "leap" to make it worth the effort and Airbus should wait for the Advance. I'm not sure if events are proving them right or wrong. Airbus wanted something on the market relatively soon, and we can imagine that all the T1000 issues plus RR's general financial situation would have made waiting for the Advance the wrong move. I do think evidence supports your point, that Airbus has slowed the production line down to the minimum feasible rate knowing that the only viable future includes something like a genuine next generation engine such as UltraFan, a stretch, and quite possibly new wings too. The main unknown is if there will be a market big enough for an aircraft that big moving forward. Keep in mind the A380 is a 777X with an A330 main deck bolted on as an upper deck. It's a very big airplane and we have lots of data points telling us the market is moving way from such large aircraft, and the kind of things needed to get A380 back in to the game are very expensive. Also keep in mind we are now witnessing a total changing of the guard at Airbus, and all the grey hairs associated with A380 are retiring and being replaced by younger people that do not have the same kind of emotional commitment to A380 as the old guard did. If we go into a period of soft or bad economics, those "digestible" A380 losses might become indigestion. Seems to support the idea that Advance might not be enough. Ok, but is it worth it to Airbus to spend $0.5 billion (very unlikely to be that low, but we will roll with that) on the A380 so EK can continue to have all the leverage in regards to the future (and therefore things like pricing) in the program? Does Airbus want to waste their time on this song and dance every ~5 years when they need more frames for production and have to play the woo and court and beg EK game? What if EK is no longer in a financial position to accept new A380s by the bucket load (STC won’t be around forever, next EK leadership could be a total buffoon who runs the airline into the ground)? The A380 has better cost/seat than the 77W yet the 77W significantly outsold it. Many people here (including you, iirc) are rather pessimistic about the 779X’s future. 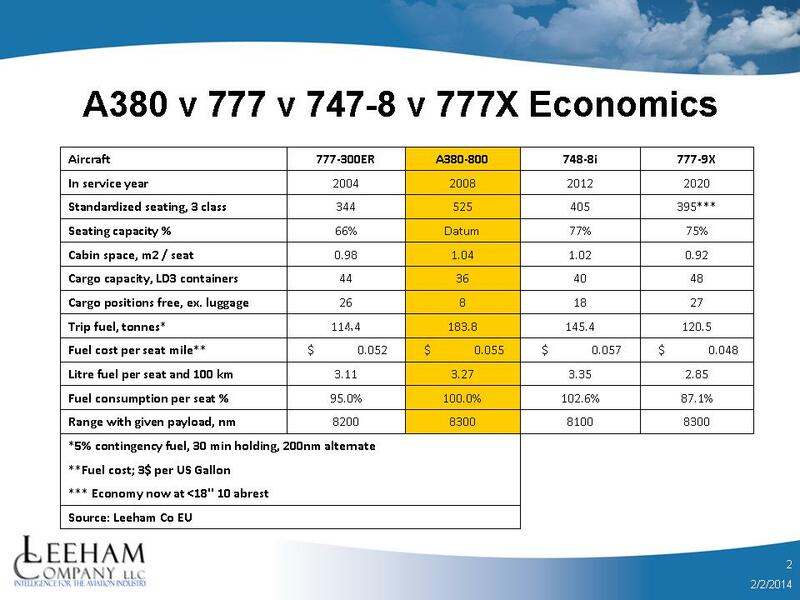 But the A380 suddenly having better seat/cost than the 779X = program/sales success? That logic doesn’t really check out. Perhaps spending that $0.5b (and then some) on a stretched A350-1100 would be a wiser investment. Perhaps RR would rather spend their money on an engine suitable for a -1100 (using tech/lessons learned from Advance testbed) then turning the Advance development platform into a realized actual production engine. is it efficient enough though? emirates isnt really doing all that well right now. I wonder if perhaps ten years down the line even the new airports will start filling up and make the A380 viable again. Also, oil prices at $50 should in theory be good for this plane. I did some reading on this. In short, we first heard of the Advance + UltraFan road map in the 2014 time frame ( http://aviationweek.com/commercial-avia ... -test-plan ) when both were separate engines, with Advance being the basis of UltraFan. Since then it seems that we hear of Advance as more of a demonstrator ( https://www.aero-mag.com/future-funding ... velopment/ ) that will become the core of UlraFan. UltraFan has hit design freeze ( https://www.ainonline.com/aviation-news ... ign-frozen ) and is being offered to Boeing for use on the NMA ( https://www.ainonline.com/aviation-news ... oeings-nma ) which suggests to me that Advance will not be offered as a separate engine, and will serve as a demonstration program to prove out the core of the UltraFan. In previous Trents, the HP spool was similar and the engine grew by expanding the intermediate pressure spool work. The Advance reverses this trend and the load is shifted towards the high pressure spool, with a greater pressure ratio, up to 10 stages compressor compared to 6 on the Trent XWB and a two-stage turbine against the current single-stage, while the IP compressor will shrink from the 8 stages of today’s XWB to 4 and the IP turbine will be single instead of two stages. Basically it is a new architecture with the workload arranged differently amongst the 3 spools. This will make the transition to UltraFan which will in essence be a two spool engine attached to a gearbox, which is some times called a two and a half shaft configuration. Given how different the Advance/UltraFan architecture is, it is hard to see how it could be a direct source of PIPs for the current Trents. The Advance3 ground-based demonstrator includes lean burn, run before on a Trent architecture only; ceramic matrix composite (CMC) for turbine high-temperature capability in the first stage seal segments and cast-bond first stage vanes; hybrid ball bearings with ceramic rollers running on metallic races, required to manage high load environments inside smaller cores. Opened in 2016, R-R’s $30 million CMC facility in California produced its first parts, seals, for the start of their deployment before being used in the static components of the second-stage HP turbine. The twin fuel-distribution system in the lean-burn combustor adds complexity by doubling the pipework and with a sophisticated control and switching system but should improve fuel consumption and lower NOx emissions. Hybrid ceramic bearings are newly configured to deal with loading changes and will cope with higher temperatures. More variable vanes in one IP and four HP compressor stages will be optimised for constant changes through the flight envelope. An air pipe is produced by additive manufacturing and prototype components come from new suppliers. The Advance3 will survey bearing load, water ingestion, noise sources and their mitigation, heat and combustor rumble while blade-tip, internal clearances and adaptive control operation are radiographed in-motion to verify the thermo-mechanical modelling. The Boeing New Midsize Airplane needs falls in its thrust range. Advanced cooled metallic components and ceramic matrix composite parts will be tested in a late 2018 demonstrator based on a Trent XWB-97 within the high temperature turbine technology (HT3) initiative. Maybe some of these technologies will migrate back to the earlier Trents in the form of PIPs. Ok, but is it worth it to Airbus to spend $0.5 billion (very unlikely to be that low, but we will roll with that) on the A380 so EK can continue to have all the leverage in regards to the future (and therefore things like pricing) in the program? If they wanted to do that, I think they would have decided to launch a program to hang T7000 on A380 in the 2014-6 time frame. They had the sister A330neo program to support the costs, and they had STC dangling a 50 ship launch order in front of them. It would have helped keep pressure on 777x and kept the A380 'halo effect' in place. Since the numbers didn't work out then, I doubt things would be different now. Instead, the program seems to be on life support, hoping for a great comeback some time in the future, presumably when UltraFan is a viable option. Of course, life support doesn't always lead to a great comeback, some times the plug gets pulled. The Bjorn/Leeham data I posted as you were writing refutes that statement. I am somewhat pessimistic about 777X too, but am willing to be surprised. I don't think it will ever be the same kind of success the current 777 has been. The market seems to have shifted to the 789/A359 as the sweet spot, rather than having grown to the 778/779 size as Boeing might have hoped. Thus those products seem to be destined for (relative) niche status. Don’t get me wrong, I’m under no illusion that the 77X will be some huge success like the 77W. I believe that that market has shifted to the A359/789/787-10 size (I don’t fully buy the A35K/779 sales are slow because not replacement time or whatever), and I don’t know between the A380/77W which is better per seat. But I’m pointing out that if you believe the A380 is better per seat (as mjoelnr appears to believe, based on his statements) then the sales difference between them suggests CASM is not the end all be all that some want to make it be. But I’m pointing out that if you believe the A380 is better per seat (as mjoelnr appears to believe, based on his statements) then the sales difference between them suggests CASM is not the end all be all that some want to make it be. Great CASM is a requirement for a VLA, but it's not a guarantee that a VLA will be a success. I think the A380 has taught the world a few lessons: that the number of routes that a VLA can be successful on is smaller than many people imagined, and that in most cases there are more favorable ways to deal with airport congestion than using VLAs. The "build it and they shall come" idea has not worked out well for the A380. If you adjust the numbers to same sqm/pax things look differently. Without knowing exactly how they calculated cabin area it’s hard to tell if that number is because the A380 is in a more comfortable/premium layout or because of the inherent space inefficieny that arises from double deck vs single deck designs. Airlines don’t really look at sqm/pax, they won’t “compensate” by throwing in more Y seats to get sqm/pax down. Does it really matter? None of them is selling. Who really cares who the King of Nowhere is? The A380 has become a fascinating program to me. It's basically a one trick pony, designed for slot constrained hubs in a $100/bbl oil world. When it was being launched, there were few signs that the price of oil would ever drop to the $50's again and horror stories about the difficulties of getting airports built and/or expanded, (especially in the EU), abounded. Airbus went with the 380 and Boeing chose the way of the 787. I think most will agree that personal preferences aside, the new, efficient twin route was the right choice. Airbus figured this out eventually which is why the 350 came into being but by then, they had sunk many billions into the 380 and it would have meant way to much egg in the face to bail on the program. Boeing wasn't immune to the lure of the Mega VLA, and spent way too much money warming over the 747. Whether through foresight or luck, they happened to have an ace in the hole; the 777-300ER. That aircraft went through the 380 and 747 programs like John Wick. It forced Airbus's hand to spend more billions on the ill fated 340-500/600 and to upsize the 350 just enough to make it slightly less efficient than the 787 in enough respects to make a difference. Ironically, even the 77X and the 350-1000 may be too big in today's world. A lot of this was only realized in retrospect and considering how many balls both companies have dropped in recent decades, (more due to decisions based on one-upmanship and ego than realistic planning and design), it doesn't seem appropriate to hand out pats on the back to the corporate overlords. Now, the 747 is being put to sleep and the 380 is on life support. Both are a drain on their respective companies and are being kept alive despite not being in the best interest of either company or their suppliers. It's time to put ego aside pull the plug. There are more than enough 380's already made to fulfill any future demand. The resources required to sustain the program could better be used somewhere else...like increasing production on aircraft actually selling. EK really doesn't want any more of the current model, (and let's face it; it's EK or nobody), and there is no way that Airbus would every recoup the billions it would cost to upgrade the aircraft. It may have seemed like a good idea at the time, but that time has passed and it's now time to move on. The 748F is alive and well and Airbus has no equivalent. Look how long the 747 took to get established. More than one development generation and more than one engine generation. Only the -400 was to become the huge success. So there is no surprise that the A380 will need some time and warm overs as well to me. Especially now that both manufacturers put money in newer twins that got a higher level of engines and equipment. Are the margins higher on those twins? Now THAT might be some killer. Otherwise I'd say wait for future engines to the mid 2020s. The market keeps growing so big airplanes must be needed. Wit the same engine generation like those twins they should have a cost advantage. And bring back John Leahy. Or has Airbus already made the A380 decision in principle? Did Airbus hope EK would not confirm the order plus options, making line closure the default position? Or did Airbus expect / hope RR or EA would take the blame by failing to reach an engine agreement? Or ultimately, will the finance industry make the decision by re-pricing EK/A380 risk? 1. Pending 20+15 order. If Airbus preference is for the current commitment not to reach conditional / unconditional order status, best achieved by RR not finalising the related engine contract. Probably no penalties payable to EK, though refer 4. 2. Unconditional orders currently being delivered. Is Airbus topping up performance penalties on new deliveries? What penalties are payable by Airbus if already ordered (but undelivered) are not delivered due to the line closing? 3. Already delivered. Would line closure trigger buybacks on the existing EK fleet? 4. What is the future financial impact on the EK / Airbus / RR relationship? Has the 'sit on the fence' option passed? Does Airbus burn bridges and terminate the A380, skipping a generation of EK orders as collateral damage, and BFF RR missing out too, or write another chapter, funding improvements, including a new engine. What could EK and Airbus offer each other to continue the story? A330NEO in lieu of 787? A350 in lieu of 777X? Airbus / RR / EK co-fund A380NEO, including new builds and retrofits? EK-related parties involved in Airbus / RR marriage? If Boeing is smart, they will sit very, very quietly. Take no pot shots at Airbus. Make sure the 777X and it's engine over perform significantly. Check their contracts in respect model continuity obligations. It's alive, but well...? It's pretty much the definition of a niche product. It's the aeronautical equivalent of the weakest member of the Donner party. The 747 didn't have any competition. The 380 does...and lots of it. It's nowhere near the same airline world as existed when the 747 was developed. It's alive, but well...? It's pretty much the definition of a niche product. .
As long as there is a need for nose-loaders, IMO, Boeing will produce a nose-loader. AN124 and AN225 (only one ever produced) production stopped long ago. If Boeing do a twin-engine version, the cockpit could be raised to give nose-loading full height, even higher than the side door. This post is going to contain a lot from a reply in the last thread, but I dont know if it was read or responded to since it got deleted. Even if the the T7000 is 5% (or less) more efficient than the T900, at least it will still get future PIPs. The T900 will get none. There will also be cost savings in parts and maintenance. I would think higher numbers of T1000tens in production, could also make it cheaper than the T900 at some point (if not already?). The T7000 with new winglets should be at least 5%. It's about as cheap of a early "mid-life" upgrade as Airbus is going to get before they need to do a heavily updated NEO down the road. EK (or anyone else) is clearly not interested in the cabin layout of the -Plus to see the gains. So I just don't see how EK is going to get the gains they want. RR cant afford any financial penalties, and they dont have the resources to put toward improving the T900. And their reluctance is understandable given the low production numbers and the T1000ten is selling in much higher numbers. A NEO using the T7000 may not have made sense in '14-16, but a lot has changed since then. The -Plus did not materialize. No orders other than this one and ANA. The last T900 PIP fell short, RR announced there will be no further PIPs for it. Bad news for a used market when these frames are supposedly good for up to 50 years. An A380 today burns ~60,000 gallons of fuel/day (assumes ~12 hrs of operation). At $2.30 gas, that's about $50mn/year. Any decent NEO with Ultrafans, wingtips, and empennage trimming should be burn at least 35% less per pax. That's a savings of ~$18min/year. Assuming an 8% capitalization, the fuel saving alone is worth $225mn - about the sticker price of new A380. Add in savings on maintenance and fees (even a big stretch should be lighter at MTOW than A380-800) and your savings easily exceed the value of a new A380-800. Then you can figure the greater capacity of any NEO when calculating how much you'd spend for one. Then you can figure in the lower maintenance costs of a new NEO versus an old -800. In short it's ridiculous to assert that a NEO would offer value proposition similar to a used -800.
mjoelnir's basic error is to look at CASM in isolation, rather than CASM in relation to capacity. In the context of an A380 thread, he will demonstrate either genuine or (more likely) willful ignorance of the negative impact on yield of greater capacity and/or lower frequency. Being ignorant of this factor, he will suppose that airlines would happily upgauge to any size to obtain any efficiency benefit. Save 1% CASM by buying a 10,000-seater? Mjoelnir Airways Express certainly would. To come on topic again in this bring and repeating discussion. MSN 252 and 257 have done test flight in the last days, so maybe some things are settled and we can expect a delivery still this year. The main point to the declaration why Airbus was not prepared to do the neo, or plus, or neo and plus, was one single point, they would not do it for Emirates alone. So while we have all this Boeing fans here declaring how obsolet the A380 is, does the biggest user of the A380, who is also incidental responsible for nearly half of the 777x orders, still buy the A380 to add or to replace older A380. Emirates seems also to be rather unmoved by the prospect, that the older A380 they will retire, could get scrapped. Emirates seem to not see the advantage in replacing their A380 with 777x that the Boeing fans here are clamoring for. The move seems to be the other way, the A380 fleet at Emirates still grows, while the 777 fleet stays the same in numbers. The 777x is ordered to replace 777-300ER and 777-200LR. So yes I expect future A380 orders from Emirates and in the case some of the current users would renew their A380 in the future, we could well see the neo or plus. Nice personal attack without any new input but many insunations! Maybe you start to get familar with forum rules. I'm familiar with the rules; I just push their boundaries. I accept the many deletions I have been given as par for the course here. The fact is that pointing out persistent weaknesses in the analytical abilities of, or biases of, certain members serves a very great purpose on this forum. It notifies other readers to view the posting member's assertions with well-merited suspicion and notifies the member himself that the audience perceives faults he might otherwise ignore and duplicitous stratagems he might otherwise believe successfully hoodwink the audience. You might disagree with my interpretation of the rules and my moral calculus regarding serving honest, vigorous discussion versus providing a safe place for any idiot to say whatever he wants. A NEO needs to bring at least 10-12% lower effective fuel burn through the engine alone. A Trent7000 does not provide this compared to the Trent900. Ultrafan promises 25% to the early Trent 700s. That is pure fuel burn, now larger fan diameters mean more drag and it is a trade-off, so to get 12%+ improvement you need the Ultrafan. The RR3039 at -12% delta is the Advance. To estimate the Ultrafan's SFC delta vs. GP7200, we'd just multiply (1.0 - .12 ) * (75/80) = .825. So the Ultrafan should have ~17.5% lower SFC than current A380 engines (GP7270 baseline).